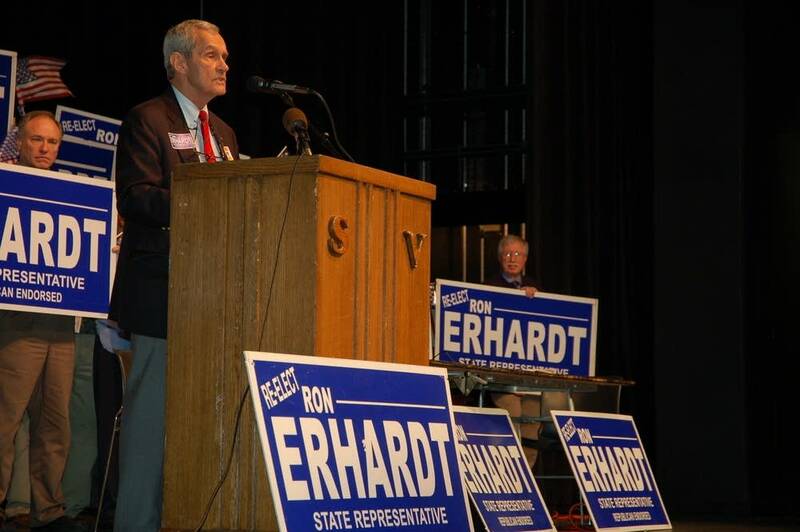 Representatives Ron Erhardt, 41A-Edina, and Neil Peterson, 41B-Bloomington, represent the two halves of Senate district 41, so their endorsing contests were held together at the Southwest Middle School in Edina. The two Republicans now share more than a Senate district. They share a new title: non-endorsed candidate. Erhardt and Peterson lost their endorsement contests by wide margins to challengers. "Madam Chair, Can I announce that the convention has formally endorsed Keith Downey and has endorsed Jan Schneider," the speaker announced from the floor as the attendees applauded. It was clear that many of the delegates attending the convention were upset with Peterson and Erhardt's decision to back a transportation bill that includes a gas tax increase and a metrowide sales tax increase for transit. The two did not shy away from their votes, saying the revenue is needed to improve the state's transportation system. Peterson said it was devastating not to win the endorsement. But he said he will run in a primary, because of the large amount of support he received for backing the transportation bill. "I've got a file this thick of people saying 'good for you. Good for you.' That's very encouraging," Peterson said. "So I came in here knowing that I do have a very strong base behind me. Not this base, but this is a game that goes to those who show up." 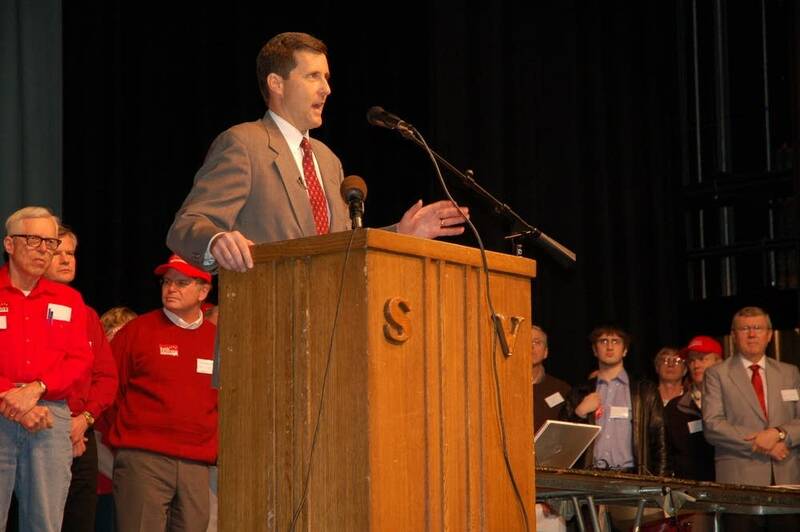 Those who did show up to the convention backed Peterson's opponent by a nearly three to one margin. Jan Schneider said Peterson did not lose because of his vote on the transportation bill. She said his overall record is out of sync with the party. 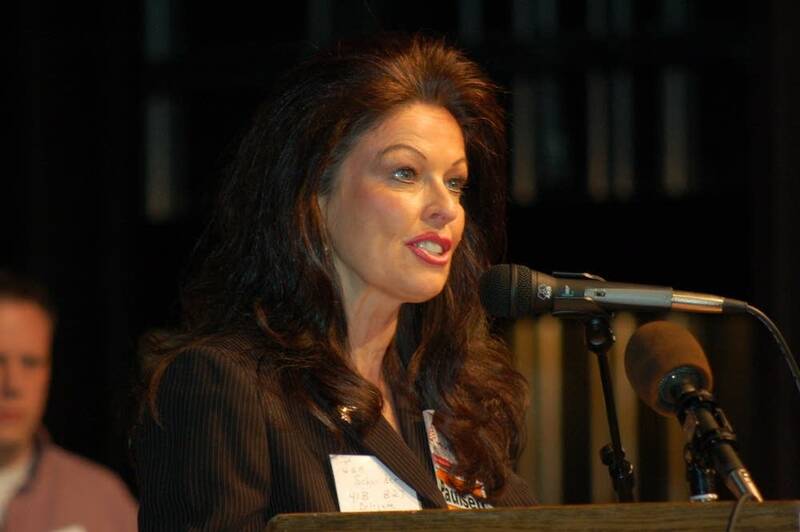 During the convention, Schneider's supporters handed out campaign material saying Peterson has the second lowest rating of any House Republicans by both the Taxpayers League and the Minnesota Family Council. Schneider said she's more in step with the principles of the Republican Party. "Once we started looking at the pattern of votes, that's why I stood up and others came today to vote, because they're looking for Republican representation. We aren't here because we don't have anything better to do on a Saturday afternoon," Schneider said. While Peterson and Schneider will square off in a September primary, Erhardt said he isn't sure whether he will run in the primary or as an independent. 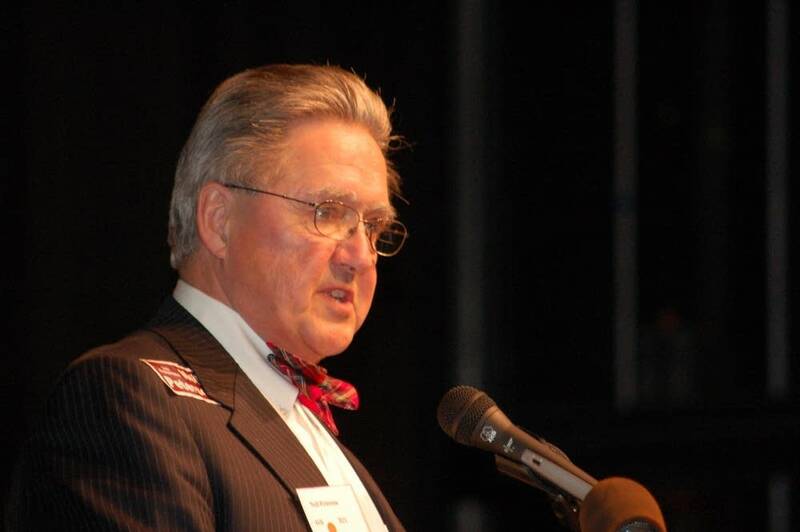 Erhardt has repeatedly said that his positions are best suited for the district. Erhardt told the delegates that voters appreciate that he's a fiscal conservative, but he is liberal on social issues like legalized abortion. "I have consistently brought in more votes than any other candidate in this district, except Congressman Ramstad. More votes than Michel, Pawlenty, Bush, Coleman or Kennedy. I fit this district," Erhardt said. Erhardt and his supporters warned the delegates that a Democrat could win this district if they backed Keith Downey, who they say is too conservative for the district. That argument didn't work. The delegates supported Downey by a greater than two to one margin. Downey said conservative Republicans can win in Edina. "This continuous branding that somehow Edina has turned into a Democrat haven, and if we don't run and govern as though we're a Democrat, that that's a losing proposition. I don't see that in the data that I looked at, and I don't see it as a level of support that I found out in the community," Downey said. Downey also said he can win a three-way race in November as long as the Republican Party is unified behind him. Minnesota Republican Party Chair Ron Carey said the party will support the endorsed candidates with both resources and volunteers. Representative Jim Abeler, 48B-Anoka, fared slightly better at his endorsing convention. Party activists in his Anoka District did not endorse Abeler, but they didn't endorse anyone else either. Abeler was two votes shy of the 60 percent needed for endorsement. He considers the vote a victory considering that many were upset with his vote on the transportation bill. "58 percent to 42 percent is a clear margin that the majority of this group of conservative Republicans agree that I'm on the right track and they know who I am and what I'm doing," Abeler said. There are three other Republicans in the Minnesota House who voted to override the veto of the transportation bill. Party activists in Kathy Tingelstad's, 49B-Andover, district have voted to postpone her endorsement. The endorsing conventions for Rod Hamilton, 22B-Mountain Lake, and Bud Heidgerken, 13A-Freeport, have not been scheduled.